You may want to modify the Avastar meshes, or just create posed static versions of the Avastar meshes. The workflows below help you to Quickly create a Mesh based clone of the SL Avatar. Create a tiny or a giant. Add extra shape beyond what you can do with sliders. Modify the Avastar Meshes into something totally different. The reason for this behavior is: Blender does not support editing Meshes which have Shape keys defined. 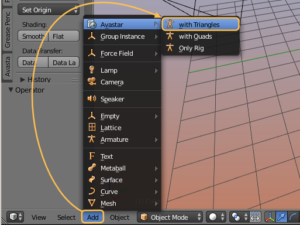 The Avastar Meshes make heavy usage of Shape keys. Hence you get major fail as soon as you touch the meshes. The Avastar is fully compatible with the character from Second Life and all similar online worlds like OpenSim for example. After a short time (typically 2-4 secs) a new Avastar character is created in the 3D View and at the current 3D cursor location . Avastar’s default Shape is compatible with SL’s default Shape. When you use Avastar’s default shape then you also need to test your work with a fresh created shape in SL. We do not use any of the Ruth shapes, because there is no clear definition what Ruth is. While there is an official definition of the default shape. The SL default Shape (Create new Shape). New Avastar characters can only be created when you are in Object Mode! A new character will be placed at the current 3D Cursor location. 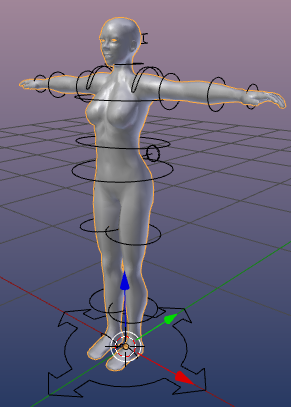 You can hide (‘h’) or remove (‘x’) not needed parts of the Avatar meshes (like the skirt or the hair for example) without breaking the tools. You can create as many characters as you like aside each other and so you can create multi-character animations. 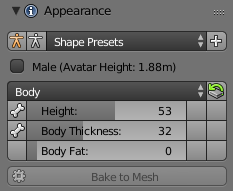 The character that you know from avatar.blend or from the workbench (sometimes also named “ruth”) looks different from the default Avastar character. this is not a mistake. Further explanations can be found in the Avastar vs. Workbench Skeleton article. Select the Rig (RMB on the yellow circles around the mesh). Here you find the Appearance Panel (see image). Shape Presets: Here you can add your own Slider configurations. When you click the white + sign the current shape slider values get stored as new Preset (see also below). Sections: A popup Menu for the different Shape Sections (In the Image the Body Section is displayed). This is equal to the Appearance Editor in SL or OpenSim. Section Reset: The icon on the right side of the Section Selector allows to reset the entire Section to its Default values. 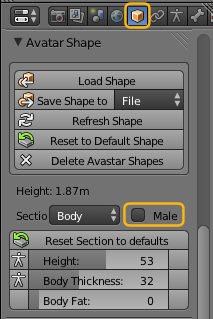 The section subpanel of the Avatar shapes panel contains the Sliders for the section specific shape keys. 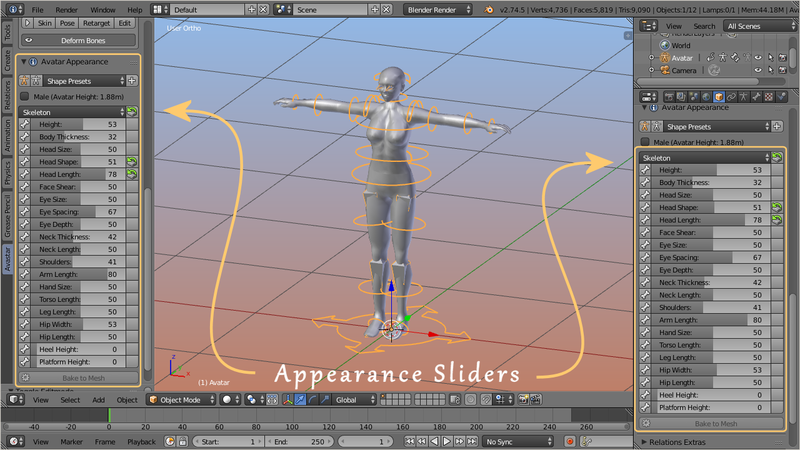 The values assigned in SL match exactly with the slider values in Blender. Some sliders have a small Bone icon on their left side. This indicates the slider affects the bones (bone sliders). All other sliders affect only the mesh (morph sliders). The icons on the right side indicate that the slider value has been changed. Click on these icons to reset the corresponding Slider Value to its default. Note: The Reset icon on the Top Right of the section panel resets the entire Bone Section to its Default Values. 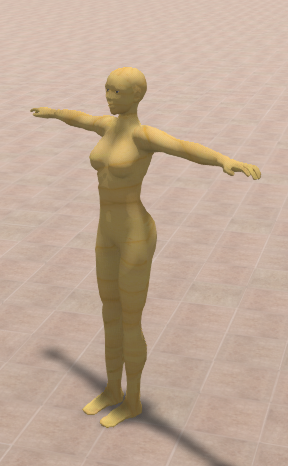 We have added 3 extra sections (Changed, Fitted and Skeleton) which do not appear in the Second Life Shape editor. The Changed section is empty by default and will be populated by the list of changed Shape sliders of your Avastar. The Fitted Section contains all Sliders which affect Fitted Mesh Bones (Collision Volume Bones). The Skeleton section (see image) contains all sliders which affect the bone length of the Avastar character. On top of the list (in the Section Header) you see a Reset button. This button will reset all shape sliders of the current Section to its factory defaults. Each slider can be dragged, or you can click on it and then type in a number. If a slider has been changed then you see a reset icon right to the slider. Clicking on that icon resets the slider to its default value. 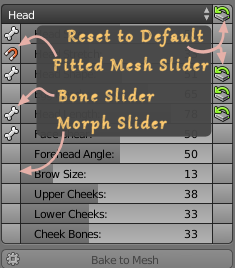 This function makes all slider changes permanent for the active (and selected) Custom Mesh. Take care: This function deletes all Custom Shape keys and the Mesh gets changed! 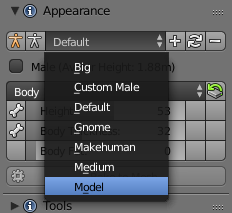 Hint: This option is not available (greyed out) for the Avastar Meshes. The Mesh deformer is an old development that came to live a couple of years ago. But the project has never been going public in Second Life. However we keep basic support for the Mesh deformer available, because other compatible online worlds might possibly support the Mesh deformer. Hint: If you plan to create Meshes compatible to the Mesh Deformer, then you will want to reset all bones in the Skeleton Section to their default values (Reset Section to defaults). Note: You can switch the Gender on and off as you like. The Avastar Meshes can not be modified. As soon as you try to do this, you will get very bad distortions. This is due to how Shape keys are handled in Blender. 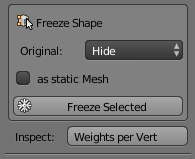 The freeze either creates static meshes from your rigged meshes, or modifiable versions of your selected meshes. The tool basically removes all shape keys and all Avastar control data. 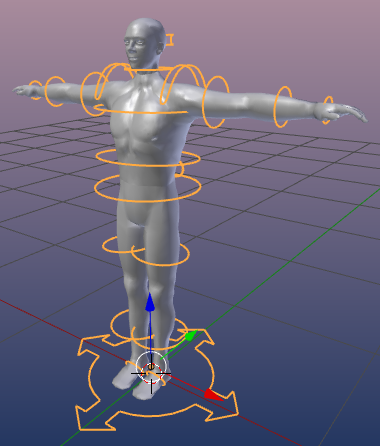 You want to create a static statue in the current pose and with no rigging information assigned. But when you export the Avastar character to SL as it is, then the imported mesh rezzes always in T-Pose, even when you exported in another pose. 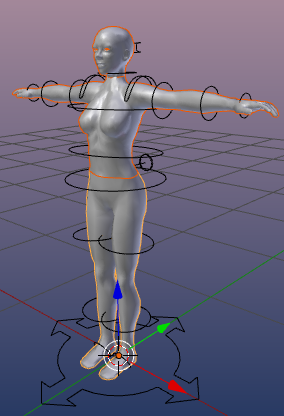 You want to modify the Avastar base meshes for optimization or as initial model for your own custom Avatar project. But as soon as you edit the Avastar meshes, they quickly get into a chaotic disorder. Ensure Blender is in Object Mode. Select all parts which you want to freeze. Note: You can apply Freeze Shape to any mesh object (unrelated to Avastar). This is practical for example when you want to apply all shape keys. It is important to understand that this tool always creates a copy of the selected meshes with all Shape Keys applied! The copies are placed exactly where the original meshes are located. Note: The frozen Meshes do no longer react in the exact same way to the Avastar sliders as the original Avastar character does. However, the meshes behave exactly in the same way as they will behave when imported into SL, OpenSim or other compatible virtual environments. When you select to Keep the Original, then the original mesh and your frozen mesh will overlap and you might not be able to see that there are actually 2 meshes now. When you select to Delete the Original, then the Original Avastar mesh is fully replaced by your frozen version. When you select to Hide the original, then the Original Avastar mesh will be hidden from view, then you only see the frozen version. when you enable Standalone Posed then your frozen mesh will be detached from the armature and it will end up as a simple non rigged static mesh. Delete: The Original Mesh is deleted. 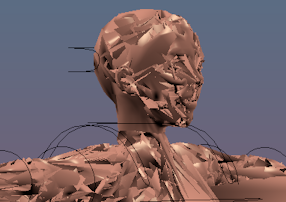 If the original Mesh was rigged to an armature, then -by default- the frozen mesh Copies keep rigged as well. But sometimes you want to get a complete static statue with no animation information at all. In this case you will select this option. If you have selected 2 or more objects, then the Join Parts appears. This option just joins the frozen parts into one resulting mesh object. 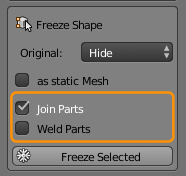 Note: If the Join parts option is selected, then you get one more option Weld Parts. If that option is checked, then all duplicate vertices along the adjacent edges of the joined parts will be merged. Caveat: The Weld Parts option only removes doubles along the welded edges. 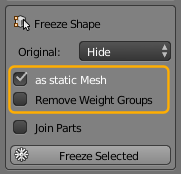 Duplicate vertices on any other place in your meshes will not be removed by the freeze tool! Joining parts of a mesh will make all parts belong to one single object. Note: You can select multiple objects by holding the SHIFT key down while you right click on the parts which you want to select.